Active Wheel 2in1 serves over 200 million households. Active Wheel is ranked #5 in the Most Trusted Brands in the Fabric Care Category as per ET Brand Equity 2016. Read more about Wheel brand. Owned by the parent company Hindustan Unilever, Active Wheel is a very renowned brand in the home care segment in India. This is an Indian origin brand and was launched in the year 1988 and is popular since then. This detergent brand was declared as the market leader in the year 2000 and is one of the top used products in the detergent segment in Southern Asia. In sales volumes, Active Wheel is one of the largest product brands in the country. The product offers freshness and fragrance both in one product and that is the USP of the brand. It is available in both – detergent powder and detergent bar and the primary use of the product is for washing clothes. It is one of the most trustworthy and prestigious brands from its parent company. The company after a lot of research has made the products using progressive technology and qualitative chemicals. This detergent goes through a lot of quality checks so that it can pass the test which is set on certain parameters by the quality auditors. One of the main reasons of the survival of this brand is this in spite of tough and rigorous competition. This brand makes 6 detergent and bars which are equally popular and have various fragrances and blends. 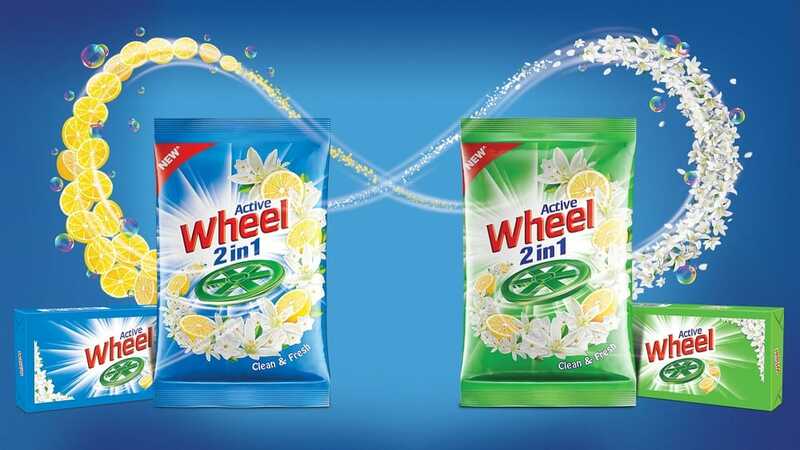 Wheel Active – Lemon and Orange: This product is enriched with the goodness of lemon and orange and the brand claims that the dirt from clothes can be removed by minimum effort with this product. Wheel Active – Lemon – This is one of the oldest products made by the company. It is still very popular in the market and has the maximum sales volume. Wheel Active – 2 in 1 Detergent Fresh – The aim of launching this product was not just make the clothes squeakily clean but also fragrantly fresh. This detergent is made by using new technology which has a chemical that quickly removes dirt. Wheel Active – Lemon and Jasmine Green – This detergent comes in the strong category of products in the market. It has strong chemicals in it which remove the dirt quickly and don’t cause any harm to the clothes. As the detergent is enriched with lemon and jasmine fragrances, it leaves the clothes smelling very fresh. Wheel Active Detergent – This is the regular blue powder made by the brand. It is available in a half kg and one kg pack. Wheel Active Blue Detergent Cake – This is in a bar format. It is known for its excellent cleansing properties. The bar has a refreshing fragrance and is gentle on hands. This brand started off its journey in India but today is available in most of the parts in Southern Asia. Other than India, this brand is a market leader in Nepal, Sri Lanka and Bangladesh as well. It is popular in various other south Asian countries as well. In a report, Wheel Active was present in all parts of India and in 2 million households across the country. This is possible because of the widespread distribution network of its parent company Hindustan Unilever. The research centers for this product are located in Mumbai and Bengaluru. The pricing strategy adopted by the brand is very competitive. The aim of the product is to not just target women to wash clothes but also men doing this household chores. The brand follows the penetration pricing policy. The promotions done by the brand are aggressive and mostly for the masses. The aim is to create brand awareness in all the segments in India. As the target audience of this detergent brand is fixed, it has created some impressive and memorable ads in the past. Wheel Active as a brand promotes its products via billboards, newspapers, other print mediums and digital. A unique campaign done by the company was when it asked its consumers to give a missed call on the number 1800-3000-1599. The people received an auto-generated call and heard snippets of conversation between a couple. This ad campaign proved to be a hit and the brand was successful in creating further visibility in the consumer market. The tagline used by the brand are ‘Mehangi wali dhulai budget mein samai’ and ‘Nimbu ki Shakti aur hazaro phoolo ki khushboo’. The company has received many awards and recognition in the detergent category. As per the report of ET Brand Equity 2016, Active Wheel occupies the fifth position in the Fabric Care Category as the Most Trusted Brand. The Brand had roped in Bollywood actors like Salman Khan, Vidya Balan, Prachi Desai in the past to promote the product and had come up with innovative ads which are still remembered. These Bollywood starts were roped in by the brand around 8 years ago. The aim of this campaign was to promote the fact that it is not only a woman’s job to wash the clothes but a man can also help her do this.